Cut the tops off each pepper and remove the seeds from the inside with your hands. Fill a large soup pot 2/3 with water and bring to a boil. Add 2 Tbsp vinegar and 1 tsp salt. Place all of the peppers and their lids in the pot. Add more water if needed to cover the peppers. Cover and cook 3 minutes, then turn off the stove and let the peppers sit while you prep the rest of the ingredients (about 30-40 minutes). Reserve 2 cups of water from the pot. In a large skillet, heat 4 tbsp oil over medium/high heat. Add 3 grated carrots, 1 chopped onion, 2 cups chopped tomato and season with parsley, 1 tsp dried oregano, 1 tsp salt, and 1/2 tsp pepper. Saute until soft. Press 2 cloves of garlic into the skillet and saute another 1-2 minutes. Remove from heat. In a large bowl (I use my Kitchen Aid with paddle attachment for this) mix: 2 lbs ground beef, 2 1/2 cups cooked white rice, 2 whole eggs and 1 tsp salt. Mix in the sauteed carrot mix until well combined. Loosely stuff the peppers with the beef mix. Fill them but don't pack the mixture in. Arrange them in a dutch oven or a large soup pot with tight fitting lid. In a large skillet, saute 2 grated carrots, 2 cups freshly chopped tomatoes (or 1 cup marinara). Stir in 1 Tbsp Mrs. Dash, 1/2 tsp salt, 1/2 tsp sugar and a heaping tbsp of sour cream. Add 2 cups water and stir to blend. 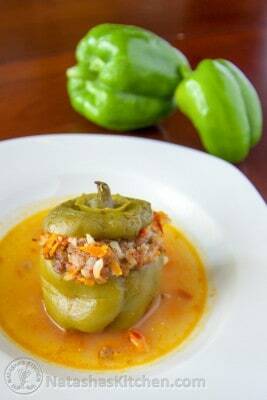 Pour the sauce over the stuffed peppers and cover peppers with lids. If using the lidded soup pot, bring to a light boil, then cover and simmer 40 minutes over medium heat. If using a dutch oven (recommended method), cover with lid and bake at 450°F for 20-25 minutes, then reduce heat to 350˚ F and bake 1 hour. Serve with a generous dollop of sour cream.